This system detects the lane with the sensor at the front windshield and warns you when your vehicle leaves the lane. The LDWS does not make the vehicle change lanes. It is the driver's responsibility to always check the road conditions. Do not turn the steering wheel suddenly, when the LDWS warns you that your vehicle is leaving the lane. 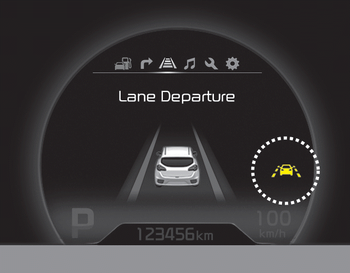 If the sensor can not detect the lane or if the vehicle speed does not exceed 60km/h, the LDWS won't warn you even though the vehicle leaves the lane. 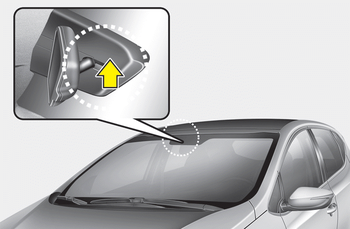 If your vehicle has window tint or other types of coating on the front windshield, the LDWS may not work properly. Do not let water or any kind of liquid come in contact with the LDWS sensor. Do not remove the LDWS parts and do not affect the sensor by a strong impact. Do not put objects that reflect light on the dash board. Always check road conditions because you may not hear the warning chime because of audio and external conditions. 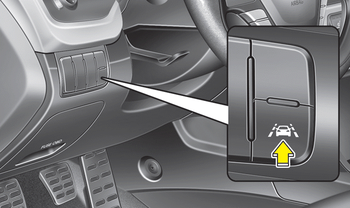 To operate the LDWS, press the switch with the ignition in the ON position. 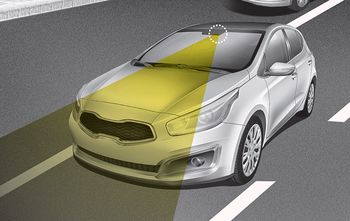 The indicator illuminates on the cluster. To cancel the LDWS, press the switch again. 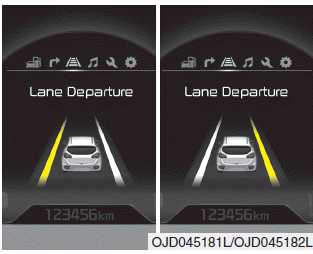 If you leave the lane, the lane you leave on the LCD display blinks yellow with 0.8 second of interval. 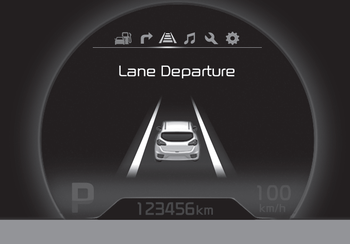 If you leave the lane, the warning sound operates with 0.8 second of interval. 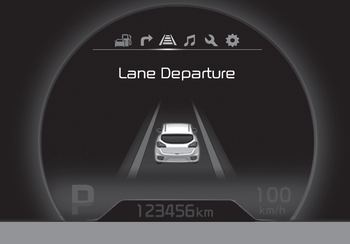 If you change the display mode of trip computer while the LDWS is ON, the symbol of the LDWS will display like a picture. The color of symbol will change depend on the condition of LDWS system. - White color : It means the sensor does not detect the lane line. - Green color : It means the sensor detects the lane line.